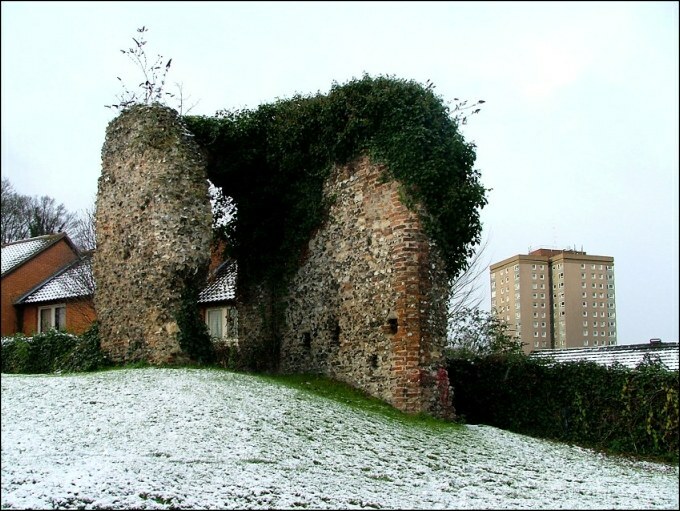 The medieval city of Norwich was based around the Norman castle, and with the modern inner ring road performing a circle of the centre it is easy to forget that the medieval city was not round at all. In fact, there was a long straggle of suburbia to the south along Ber Street and the Royal Conesford highway, the main route to London - today, this is King Street. Rouen Road, separating the two, is a post-war invention of no historic significance. Conesford had a vigorously independent life, and no less than nine parish churches of its own, four of which survive. 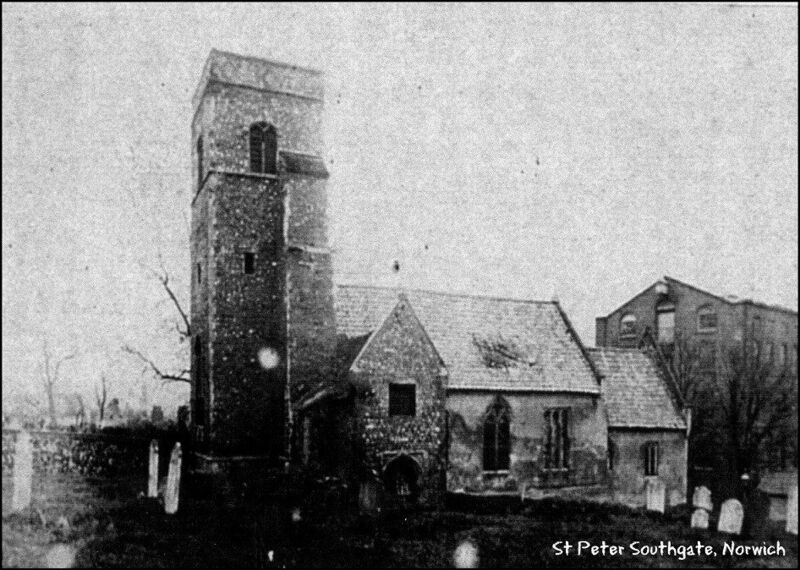 St Peter Southgate was the most southerly of the nine, sitting close to the Berstrete Gate in the city walls, and actually continued in use as a parish church until well into the 19th century. By the Victorian times, most of Conesford had given way to warehouses and factories, and the slum houses of the poor in St Julian and St Peter Parmentergate parishes. 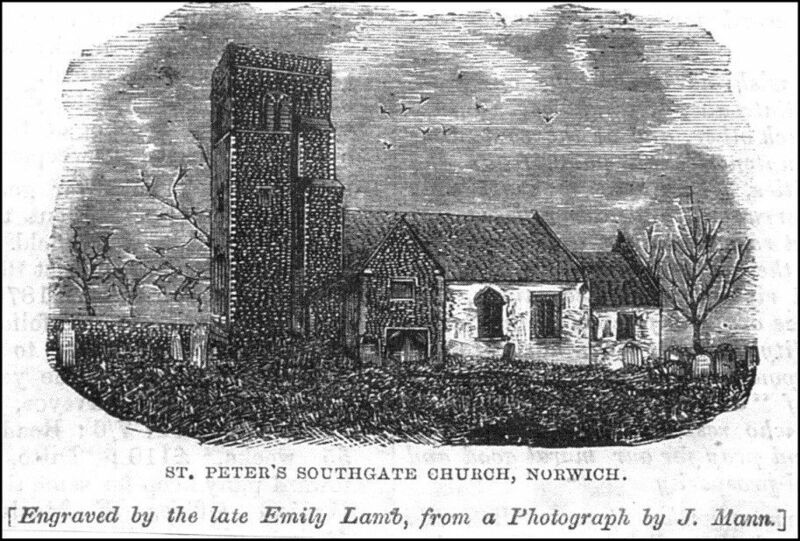 Here on the southern tip Norwich had expanded to engulf Lakenham, with its own parish churches, and the enthusuastic Victorians built St Mark only a couple of hundred metres from St Peter Southgate. This probably sounded its death-knell. St Peter fell into disuse before a proper 19th century restoration could save it, and because it was in a dangerous condition which can't have been helped by its drastically sloping site it was taken down in the 1880s. 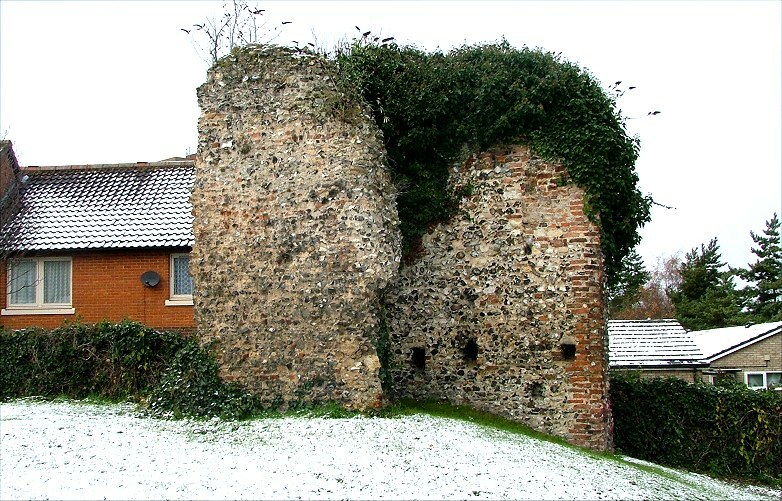 Only the lower part of the tower survives, and you can make out a red-brick tower arch that must have been 15th century at the earliest, pointing to a rebuilding at this time. But apart from the tower it was never a large church - and could not have been, given the slope. 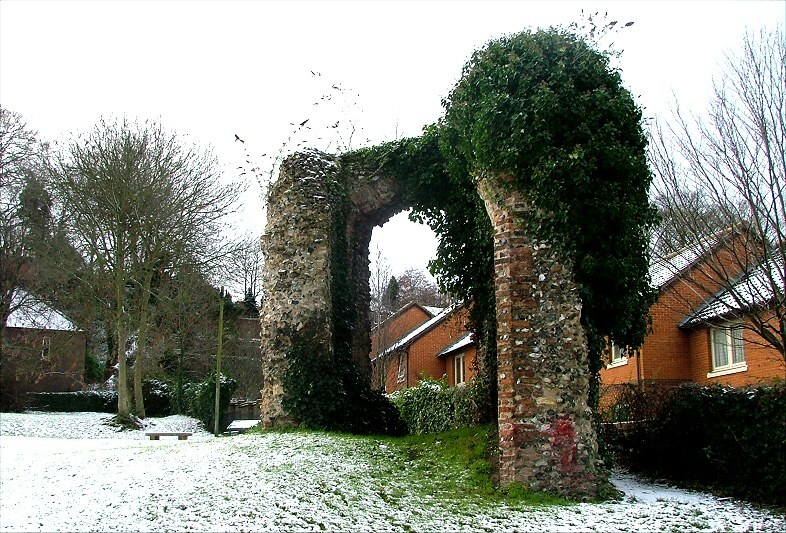 Today, you'll find its ruins just to the north of King Street, hidden away up a narrow passage called Southgate Lane, beside some sheltered flats. The photograph and engraving of the church here were kindly provided by John Sapey. 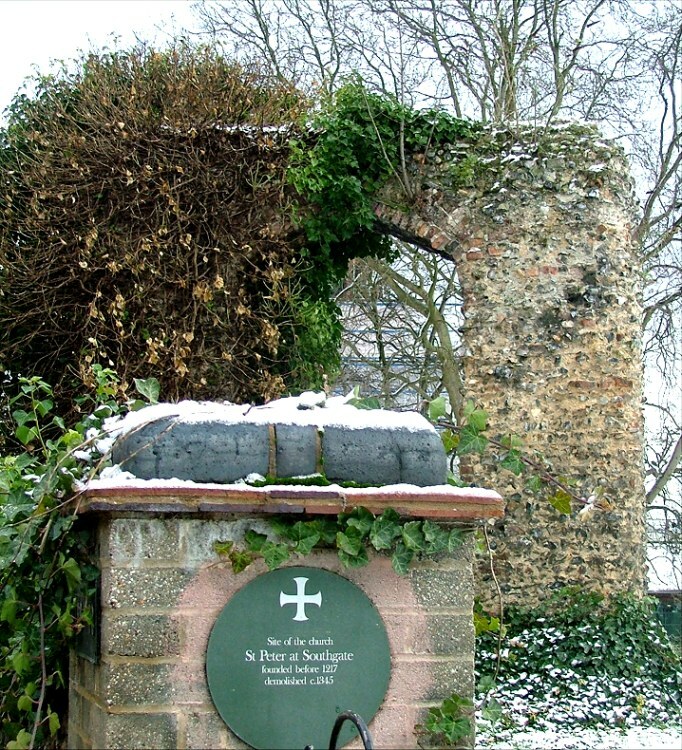 Curiously, the Norwich Society plaque on the building records that it was demolished in the 1340s, which is obviously incorrect given the photographic and other evidence of its survival. Perhaps this date refers to an earlier rebuilding, but you'd think that someone would have noticed.